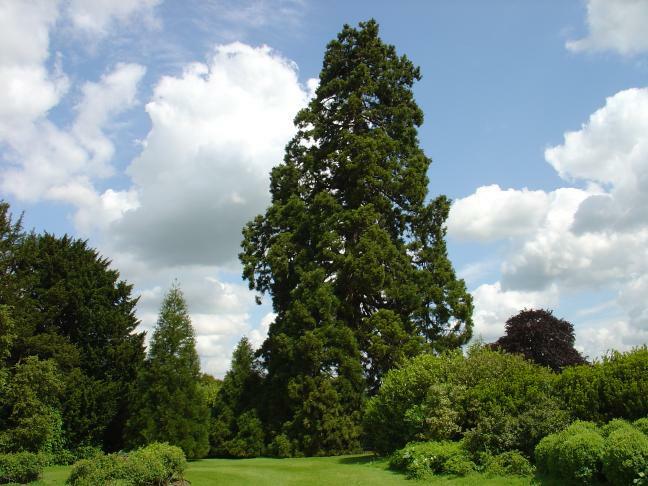 Among the ten Giant Redwood at Audley House there are two in particular that stand out from the rest. What makes them unusual is that their roots that sprouted upward and have formed numerous individual stems around the original tree. These stunning examples of this rare phenomenon are similar to the ones found at Cambridge University Botanical Gardens and Shalstone Manor. As if this were not enough to make them special, in addition many of their large low branches have attached themselves to the ground and have also sprouted upwards in the form of fresh new trees! Curiously, these "treelets" have a huge profusion of small cones. They are approximately two-thirds the size of a standard full-grown cone and even more are currently in production, as the photograph below shows. There are also eight "normal" Sequoiadendron giganteum, including several young trees. Two of these stand in a line with an older tree on the other side of the river Cam, near Adam Bridge, while the rest of the Sequoias are around the four corners of the house amongst the gardens.